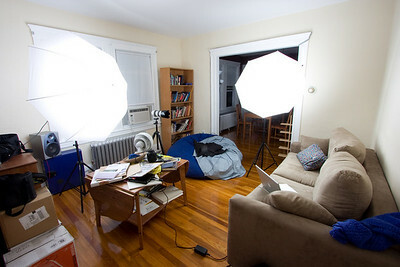 Self portrait setup in our small living room. AB800 into a 48in shoot through umbrella on the right, key light (and a lot of splash onto the white wall behind). AB800 into a 60in shoot through umbrella on the left, fill. No room light, just the bees. I sat on the couch, EF 70-200 f/2.8L IS on the tripod. This was shot with the EF-S 10-22 super wide angle. 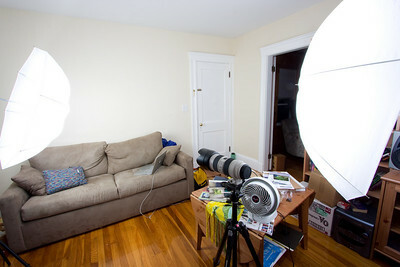 Different angle of the setup described in the previous photo, approximately behind the lens. Fill light at the right, key at the left. You can see how the key light is basically from the side. Notice how much the 10mm focal length distorts! 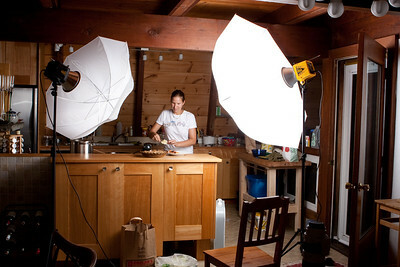 Strobe setup for Blueberry/Peach Crisp photos. AB800 camera right 1/2 power. AB800 1/32 power camera left. Paul C. Buff shoot through umbrellas.